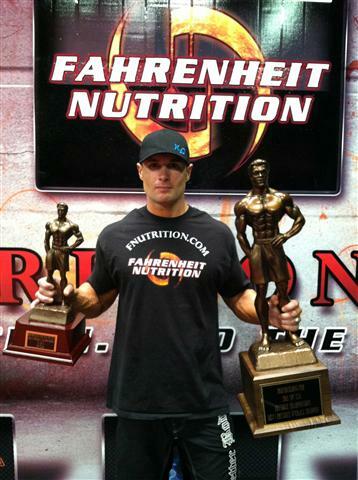 Fahrenheit Nutrition has been my biggest support group in preparing for this competition. They constantly look for innovative ways to stay ahead in the supplement industry. Fahrenheit Nutrition President Bruce Davis had reason to be proud on Monday, sitting at his post in Hutto, TX and surveying the results of Saturday’s NPC USAs. Two Fahrenheit Nutrition athletes, Trent Calavan and Dawn Hinz-Pugh, each took down crowded fields of competitors to place first in their respective class, and each earning their IFBB Pro Cards. Calavan, a Men’s Physique Competitor from Pflugerville, TX took the Men’s Overall Physique competition, while Hinz-Pugh, a Women’s Figure Competitor from Austin, TX topped a very crowded field in Women’s Figure Class F.
Trent Calavan shows off his hardware he pickup by winning 1st in division and 1st overall, at NPC USA Men's Physique Championships in Las Vegas earning Trent his pro card! Dawn Hinz-Pugh showing he winning pose! Dawn took first place in her division at NPC USA FigureChampionships in Las Vegas last month. Her victory earned her a pro card! Dawn Hinz-Pugh's trophy for winning her division, earning her a pro card, at the NPC Figure, Championships In Las Vegas.